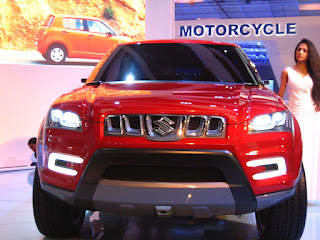 Who would have thought that Maruti Suzuki would get into the, so far unexploited, mini SUV segment? What's the first thing that comes to mind when you think of a mini SUV or a compact SUV? I travel to a happy place in my mindscape and I imagine a strong, muscular, elegant looking, tall car that is pocket friendly. Think Audi Q3, Renault Duster, Ford EcoSport, BMW X1, Mahindra Xylo, and now, Maruti XA Alpha. Yes, cross-over SUVs are the norm of the day, especially for our market. The huge demand for a cheaper version of the traditional sports utility vehicles is really catching up (thanks to young and crazy people like you and me) and car manufacturers are already cashing in on this opportunity. 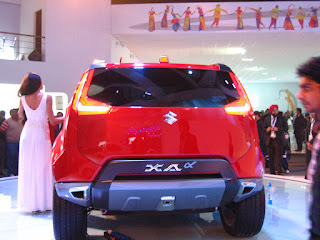 Maruti Suzuki’s XA Alpha has been a much awaited & anticipated car in the auto world. The curtains were finally pulled off this compact SUV during the Delhi Auto Expo, 2012 and the 3-door, under 4-meters, five-seater mini SUV drew in several admirers (your’s truly as well) and why not! It’s good looking, and has a solid build...is the perfect coming together of muscle power and good body proportions and elegance. Wide wheel arches, chiseled bonnet lines, an impressive five box-shaped front grille with the ‘S’ logo smack in the center, and LED headlamps add further to the style of the SUV. The name XA Alpha is symbolic and every component has a meaning. The ‘A’ in XA denotes the new compact SUV and the ‘X’ represents that the car is part of cross-over segment. The ‘Alpha’ denotes the trendiness and modern sensibilities of today’s generation. Also, the glossy Lava Red color of the Maruti XA Alpha is both a welcome change from the stereotypical blacks, browns, and whites found on SUVs in India. Well, whenever the Maruti XA Alpha hits Indian roads (hopefully at the start of Jan 2013), it will be powered by a 1.3 litre K Series multi-jet diesel engine designed by Fiat and will be priced in the sub-10lakh bracket. Alpha is expected to give a mileage of 9kmpl and have a top speed of 180kmph. The Alpha may not be the absolutely perfect Compact SUV, but it’s got enough stuff to be a head turner. And aimed at the young, urban, chic population of today, Maruti Suzuki is hoping the XA Alpha will be a worthy successor to the ever popular Maruti Gypsy. This car is packed with not only looks, style, interiors, and exteriors but with many comfort features to attract huge number of car lovers.